The Savuti Channel is a legendary wildlife region, best known for its large number of predators. Nothing on earth can prepare you for the close encounter with African nature in the Okavango Delta at Savuti Camp - truly one of the world's greatest natural, unspoilt safari wildness. You meet Africa on its own terms. 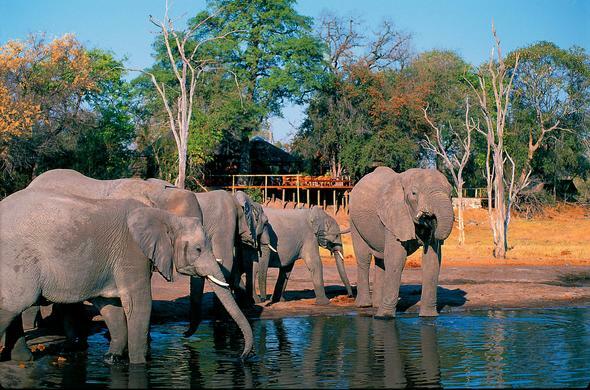 Savuti's luxurious camp is situated in in the southern part of the Linyanti Wildlife Reserve in Northern Botswana. It is expertly run by a camp manager and experienced rangers who will ensure that you enjoy your safari vacation in safety and comfort. As the camp's waterhole will be the only supply of water for a large area, one of the highlights of Savuti Camp is the fantastic wildlife viewing from the camp and from various hides in the area. African diverse plains, salt flats, rivers and vegetation of magnificent Botswana will astonish and delight your Savuti Camp vacation. This remote and sparsely populated safari region of Southern Africa remains virtually untouched by the 21st century. Evolved from a combination of climate and geography over thousands of years, this safari land presents a spectacular collection of flora and fauna. This African safari supports an astonishing multiplicity of wildlife from the smallest and most delicate of creatures to the biggest game in southern Africa. Okavango Delta, an idiosyncratic river that crosses northern Botswana for thousand kilometres without ever reaching the ocean. Instead it settles into a massive lush delta of low-lying wetland and it's gradually and eventually absorbed by the insatiable sands of the arib Kalahari Desert. Lions have backward-curved horny papillae that cover the upper surface of the tongue. These are useful both in holding onto meat and removing parasites during grooming. Unlike other cats, Cheetahs can only partially retract their claws which are not covered by sheaths. The Cheetah's scientific name, Acinonyx comes from the Greek words "akaina" meaning 'thorn' and "orux" which means 'claw'.